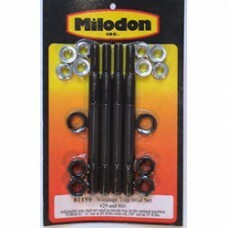 Milodon windage tray install kits are required to properly mount the windage tray. Adjustable mounting position allows the tray to work at its maximum potential by being as close to the rotating assembly (min .100”) and to avoid any unnecessary interference with the oil pan. Designed for Ford 429-460.